San Francisco (AP) – It was a busy time for Santa Claus, but he made time to feed some fish in San Francisco. The California Academy of Sciences launched its holiday festivities by having a scuba diver dressed as St. Nick submerge into a coral reef exhibit while dozens of children watched from behind the glass. 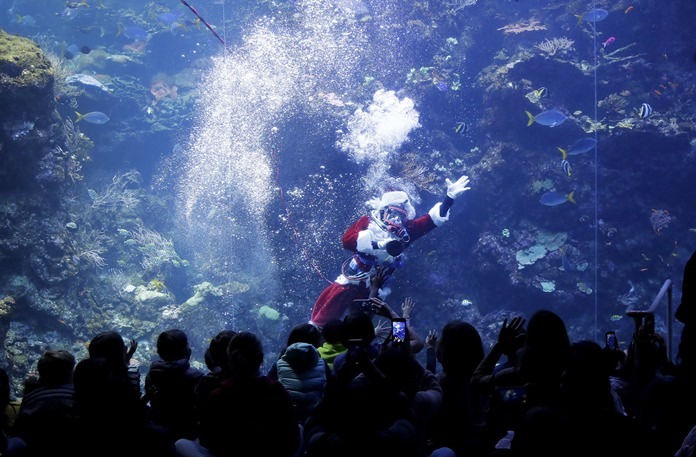 The “Scuba Santa” show took place during the morning feed at the Philippine Coral Reef tank at the San Francisco museum. Volunteer diver George Bell donned his Santa suit, from hat to coal black boots, and scuba gear for a recent feed and fielded visitors’ questions from inside the tank. The Philippine Coral Reef tank has thousands of reef fish representing about 100 species. Monmouth Beach, N.J. (AP) – Police in New Jersey have given $3 to the person who found it 14 years ago. Paige Woodie was 12 years old when she and a friend discovered the cash and turned it into a Monmouth Beach police officer in 2004. Sgt. Jeff Godwin tells the Asbury Park Press people who turn in found money are able to claim it within a reasonable amount of time if no one comes forward. The cash turned up during an audit and police “thought it had been long enough.” Woodie says officers came to her home and asked if she could remember what she did in 2004. She couldn’t think of anything bad. That’s when the officers turned over the $3 in an evidence bag. She says half belongs to her friend. Somers Point, N.J. (AP) – A New Jersey woman has her wedding ring back, nine years after she accidentally flushed it down her toilet. Paula Stanton was sure the diamond-encrusted gold ring was lost forever after she noticed it wasn’t on her finger while she was cleaning her bathroom nearly a decade ago. Luckily, a member of Somers Point’s public works department remembered Stanton mentioning the ring about three years ago. Last month, Ted Gogol was doing maintenance work near a manhole about 400 feet from Stanton’s house. He tells the Press of Atlantic City he saw a shiny object sitting the mud. It turned out to be Stanton’s ring, and after boiling it in peroxide and lemon juice, she is wearing it again. 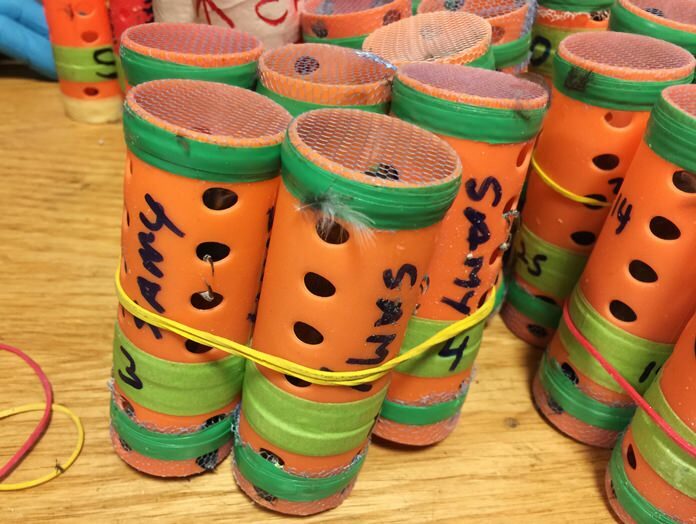 New York (AP) – Customs officials at New York’s John F. Kennedy International Airport say they found 70 live finches hidden inside hair rollers. Authorities say a passenger arriving from Guyana on Saturday had the songbirds in a duffel bag. The New York Times reports officials believe the birds were brought to the U.S. to participate in singing contests. Customs officials say people bet on how many times the finches chirp, and a winning male finch can sell for up to $10,000. The birds were turned over to veterinarians to the U.S. Agriculture Department, and the passenger was sent back to Guyana. U.S. Customs and Border Protection says bird smuggling could threaten agriculture through the possible spread of diseases such as bird flu. Customs officers have seized about 184 finches this year.